California Internet, L.P. DBA GeoLinks (“GeoLinks” or the “Company”) hereby submits these Reply Comments in response to comments filed on the Notice of Proposed Rulemaking (“NPRM”) released in the above-captioned proceedings. 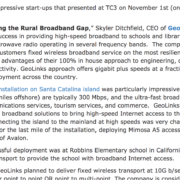 GeoLinks is one of the fastest growing Internet and phone providers in America and the fastest growing telecom in California. 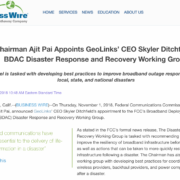 In an effort to be a truly competitive service provider throughout its service territory, the Company has a vested interest in ensuring that the FCC’s policies allow fixed wireless broadband service providers access vital spectrum resources. GeoLinks applauds the Commission’s efforts to make more spectrum resources available for wireless uses. It is undeniable that additional spectrum is necessary to meet “America’s appetite for wireless broadband connections.” However, GeoLinks urges the Commission not to assume that more unlicensed spectrum is sufficient in and of itself to meet the ever-growing demand for these connections. Moreover, GeoLinks urges the Commission not to limit how fixed wireless service providers may use these new unlicensed resources, and to create rules that allow for Point-to-Multipoint (“P2MP”) use within the 6 GHz band. Traditionally, fixed wireless ISPs have operated in the unlicensed bands (i.e. 2.4 and 5 GHz). The lack of access to licensed spectrum has forced fixed wireless providers to get very creative about how they provision highspeed and high capacity broadband services (including multi-gigabit speeds). While several fixed wireless providers, including GeoLinks, have been very successful in utilizing the unlicensed bands, the application of these bands is limited. As several commenters note, increased use of the unlicensed bands has created congestion. As Broadcom points out, “demand for unlicensed services, especially Wi-Fi, continues to grow, and the existing unlicensed spectrum in the 2.4 GHz and 5 GHz bands has become congested.” In addition, as WISPA’s comments show, the issue of congestion in the unlicensed bands has also been recognized by all current FCC Commissioners. 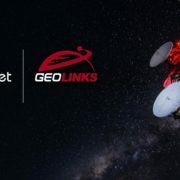 While GeoLinks sees merit in Broadcom’s assertion that making the 6 GHz band available for unlicensed use “will be a critical step in addressing the looming unlicensed spectrum crunch,” ultimately, GeoLinks believes that relying solely on more unlicensed spectrum availability (without additional opportunities for licensed spectrum) is, at best, a short-term solution. As Commissioner Rosenworcel notes in her NPRM statement, “by the end of the decade, we will see as many as 50 billion new devices connecting to our networks through the internet of things.” GeoLinks cautions that as innovation and new devices seek room in the unlicensed bands, the wireless broadband providers that offer competitive connectivity to these new devices will continue to get squeezed. Inevitably with so many wireless devices and wireless service providers clamoring for the same spectrum, the result will be the same – congestion in the bands and limited opportunities for competition and innovation. As GeoLinks has expressed before, the availability of unlicensed bands is not a one-size-fits-all solution to the ever-growing demand for spectrum. In order to craft a more complete, long-term solution, GeoLinks urges the FCC to expand the availability of unlicensed bands in conjunction with efforts to create more opportunities for licensed spectrum for competitive broadband providers. This dual approach will ensure less congestion in the unlicensed bands for those carriers supplying the connectivity that drive further innovation. With respect to new rules to govern unlicensed use of the 6 GHz band, GeoLinks agrees with various commenters that urge the Commission to create new rules that allow for and promote P2MP operations. For example, the Dynamic Spectrum Alliance (“DSA”) and Starry urge the Commission to allow higher gain antennas and P2MP operations. Similarly, WISPA makes a number of suggestions that would allow for P2MP operations such as refraining from limiting the types of services that can be offered in the U-NII-5 and U-NII-7 bands. 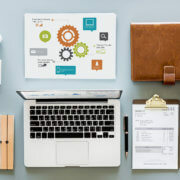 As GeoLinks has previously explained, P2MP technology creates opportunities to connect multiple users in a more cost-effective manner (even if miles apart), making it ideal for serving multiple customers in one area at a lower cost. As Starry notes, “point-to-multipoint deployments are essential to fixed wireless providers.” Moreover, DCA explains that these technologies (as well as point-to-point) “will help improve connectivity and competition in all markets, including but not limited to underserved areas and rural communities.” For these reasons, GeoLinks urges the Commission to develop rules that allow for P2MP use in the 6 GHz Band. GeoLinks applauds the Commission’s efforts to make more spectrum resources available for wireless uses. However, as the Commission strives to create policies and rules for unlicensed spectrum use in the 6 GHz Band, GeoLinks urges the Commission not to assume that more unlicensed spectrum is sufficient in and of itself to meet the ever-growing demand for these connections and to promote competition by creating rules that allow for P2MP use. Unlicensed Use of the 6 GHz Band; Expanding Flexible Use in Mid-Band Spectrum Between 3.7 and 24 GHz, Notice of Proposed Rulemaking, ET Docket No. 18-295 and GN Docket No. 17-183, FCC 18-147 (rel. Oct. 24, 2018) (“NPRM”). The NPRM was published in the Federal Register on December 17, 2018. See 83 Fed. Reg. 64506 (Dec. 17, 2018). See Comments of Broadcom Inc., ET Docket No. 18-295 (filed February 15, 2019) (“Broadcom Comments”) at 1, Comments of the Wireless Internet Service Providers Association, ET Docket No. 18-295 (filed February 15, 2019) (“WISPA Comments”) at 5, Comments of Dynamic Spectrum Alliance, ET Docket No. 18-295 (filed February 15, 2019) (“DSA Comments”) at 1. See WISPA Comments at 6-7 citing NPRM statements of Chairman Pai and Commissioners Carr, O’Rielly, and Rosenworcel. NPRM statement of Commissioner Rosenworcel at 1. DSA Comments at 3, Comments of Starry, Inc., ET Docket No. 18-295 (filed February 15, 2019) (“Starry Comments”) at 2. See WISPA Comments at 10. Should You Bundle Business Internet Services?